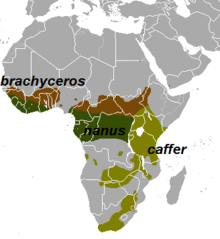 ↑ IUCN SSC Antelope Specialist Group (2008). Syncerus caffer. In: IUCN 2008. IUCN Red List of Threatened Species. Downloaded on 29 March 2009. Database entry includes a brief justification of why this species is of least concern. หน้านี้แก้ไขล่าสุดเมื่อวันที่ 11 พฤษภาคม 2561 เวลา 06:47 น.